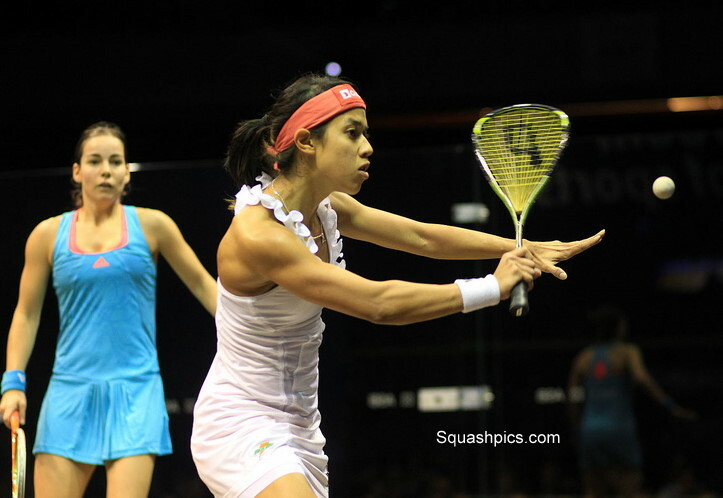 Defending champions, top seeds and world number ones Nick Matthew and Nicol David both successfully defended their World Open titles in contrasting finals at the Luxor Theatre in Rotterdam, the Netherlands’ City of Sports. 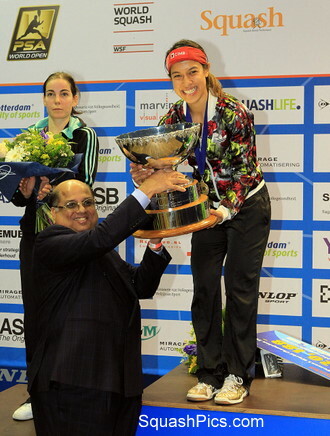 Malaysian superstar Nicol David collected a record SIXTH World Open title here at the Luxor Theatre in Rotterdam with a supreme performance to dismiss second seed Jenny Duncalf in straight games in just under half an hour. The English world number two didn’t do anything wrong, made very few unforced errors, but it was hard to see where her points were going to come from, such was the control that the Malaysian, moving and hitting supremely well, was exerting on the match and on her opponent. Nicol led 5/0 in the first after some long opening rallies, taking it 11/2, she led 6/2 in the second, finishing it off 11/5, and was totally dominant in the third as Duncalf’s spirit visibly wilted. Six titles in seven years for Nicol. Supreme. Nicol was impressed too: “This is my best performance ever. I didn’t expect anything but I wanted it so badly, I didn’t want anybody to put their hands on that trophy but me. I had a great support in the crowd, they were magnificent, I had my parents, Liz, and a big team of supporters from Squash City in Amsterdam that came to support me. 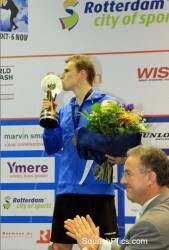 Nick Matthew, who last year became the first Englishman to win the PSA World Open squash title, today became the first player for 15 years to defend the premier PSA World Tour crown when he beat Frenchman Gregory Gaultier in a stunning 92-minute final before a packed crowd at the New Luxor Theatre in Rotterdam. 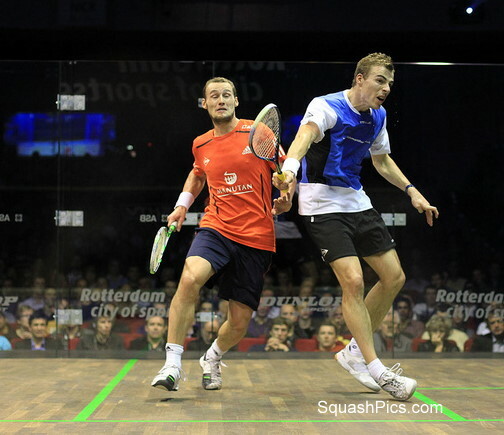 Gaultier, playing in his third World Open final since 2006, pulled away to take a tough first game – but the 31-year-old from Sheffield took an equally tough second, then pulled clear at the end of the third after the Frenchman took a small injury break after a mid-court collision. The defending champion made a strong start to the fourth, and at 6-1 it looked as if the end was in sight. But Gaultier, appealing to the crowd for help, started on a comeback that was cut short at 6-4 by a couple of errors. Once Matthew had re-established the lead, the Yorkshireman closed out the match 6-11, 11-9, 11-6, 11-5 – and raised his arms in triumph. “Being called ‘double World Open champion’ – it sounds amazing,” said the jubilant Matthew after receiving his trophy – and consigning the Frenchman to his third runner-up finish. “I can’t tell you how tough playing Greg is. We’ve been playing since we were 15 or 16. I have two or three years on him, but it shows how tough he is that even at 16, he was pushing and beating me sometimes when I was 18. He’s younger than me and he will get his name on this trophy, no doubt. “I don’t know how long that second game lasted. Greg’s been so well this week, winning in Qatar and the way he played yesterday against James was unbelievable. I just stuck in and stuck in and started to attack just a little bit. “So when I was 1/0 down, there was no need to panic. Sometimes you can get a bit frustrated and try to get the momentum with one shot at the wrong time, or with one tactic rather than eating away, little by little. So I was pleased with that mentality in that second game, because there were a few collisions, a few chats with the referee – things that can potentially spoil your concentration – so I’m glad I came through that period.” there was one thing that made a difference today,” Matthew continued. “It was probably an accumulation of a few different things. Much like when I played Pete (Barker, in the semi-finals) I had to tell myself not to get frustrated, because I was playing well – it’s just that they’re playing a little bit better at the time. Matthew, now with 21 Tour titles to his credit, had to avenge his shock defeat to young Egyptian Tarek Momen in last month’s Qatar Classic in the second round, before surviving a tough five-game battle with world No8 Mohamed El Shorbagy, also a young Egyptian, in the third. “No one can say that I’ve not had a tough draw,” continued the world number one. “The second round against Tarek in Victoria, after Qatar; the Shorbagy match; being one down against Pete; Darwish yesterday; and Greg tonight. I’ve not won too many tournaments lately. I think that when you get to number one, it’s all about winning tournaments. “My percentage of finals to wins, is good – apart from Qatar – but you’ve got to win finals. I picked my moment this week though – no one can argue! 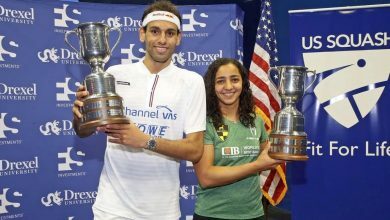 “My manager Paul Walters said to me that the Shorbagy match might have been a blessing in disguise – because I then had the day off, and I showed that I can come through and, after Qatar, losing to Shabana in the US Open and a few losses to Ramy, I may have been doubting my fitness and strength, but that’s always been there. 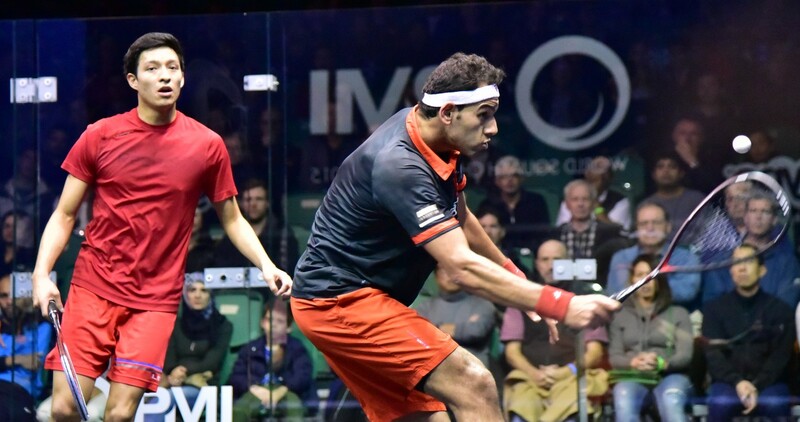 “Maybe that match made me realise, playing Shorbagy, that after that, having come through such a tough game physically and mentally, I felt that I could come through anything off the back of that,” concluded Matthew.